The structure of this system has been determined by electron diffraction to exhibit a H…H distance of ~2.1Å as in (a), DOI: 10.3891/acta.chem.scand.24-0043. Why is this of interest? Because a rotational alternative, shown as (b) could result in a significantly longer H…H distance (~ 2.6Å). Now bear in mind that the van der Waals radius of hydrogen is estimated at ~1.2Å, and that two hydrogens will be most strongly attracted by dispersion forces when separated by ~2.4Å. As they get closer, that attraction will be counterbalanced by a repulsion, which will eventually win out. Structure (b) does not benefit from H…H dispersion attractions, but are the hydrogens in structure (a) too close to do so as well? Well, let us adopt Bader’s approach, and look at the topology (QTAIM) of the electronic distribution in structure (a). The features to concentrate on are the purple dots, which in this analysis have been named bond critical points (BCP) and the single yellow sphere, which is a ring critical point (RCP). There are two other types of critical points, which I will call nuclear attractors (NACP) and cage points (CCP). The total occurrences of all these critical points is determined by a topological theorem (Poincare-Hopf), which states that NACP-BCP+RCP-CCP=1. You can see below that the H…H region is indeed connected by a bond critical point (none of the other purple dots are controversial). To a physicist, this is a real feature of the (observable or in this instance the calculated) electron density. In effect, it is a topological bond. Unfortunately, chemists like to think of bonds as entities which result in stability; a bond contributes to the stability of a molecule (and an anti-bond, should such exist, to instability). Hence aromaticity (=stability) vs anti-aromaticity (=instability). Chemists, by choice, might prefer not to call the H…H region a bond because it is probably not contributing to the stability of the molecule. Of course, the two camps are arguing about different things; the topology of the electron density ρ(r) vs the energy of the molecule. 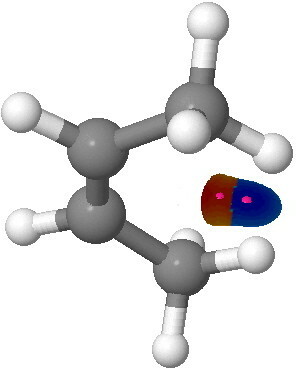 QTAIM topological analysis of cis but-2-ene. Click for 3D. Somewhat ignored in this discussion up to this point has been the yellow dot, the RCP. Firstly, notice how close it is to the H…H BCP. Secondly, notice from the Poincare-Hopf relationship that if you remove BOTH of these points, the theorem is still satisfied; a BCP and a RCP are said to be capable of annihilating each other (much like and electron and a positron might). So perhaps a chemical picture might emerge if you choose to consider BOTH points together, rather than just the BCP? I have done so below using the NCI (non-covalent interaction) procedure (which I have commented on in many other posts here). The NCI surface is shown below, embedded within the NCI surface as purple dots are the BCP and RCP discussed above. Now, the NCI method cleverly attempts to ascertain whether a region is attractive or repulsive, and it colour codes the surface accordingly. In the below, blue is deemed attractive, and red repulsive. We immediately see that the H…H BCP is embedded in an attractive region, but the adjacent RCP is embedded in a repulsive region. Whatever attraction the BCP might be experiencing is negated by the repulsion the RCP has. The two cancel (annihilate). Taken together, the H…H region is probably repulsive (ways of quantifying how NCI regions integrate are being investigated and will be discussed in a future post). Perhaps this manner of looking at it satisfies both the physicists and the chemists? The NCI surface for cis but-2-ene. Click for 3D. Well, not quite. A chemist would still ask why structure (a) is preferred over structure (b), if the wider H…H region is not deemed attractive (I call it a region rather than a bond in a probably futile attempt to avoid controversy). Actually, the answer might be in how the two methyl groups each interact with the other part of the molecule, the alkene, and how that might depend on their orientation with respect to the alkene. But that analysis is for another post! This entry was posted on Friday, October 7th, 2011 at 9:18 am and is filed under General, Interesting chemistry. You can follow any responses to this entry through the RSS 2.0 feed. You can leave a response, or trackback from your own site. why it has been concluded that the H-H contact is repulsive. It is very interesting you ask about the whole H basin. We have done such an integration, according to the protocol described in DOI: 10.1021/jp204278k. The integration for the repulsive part appears bigger than the attractive part, although aspects still need sorting. There is also another post on this theme here which elaborates using an NBO argument. Very interesting post, although I think that would not be reduced to a physicists vs. chemists issue. Indeed, Bader was an experimental physical organic chemists before moving to quantum and theoretical chemistry, why call him a physicist? IHMO, the main criticism to Bader concept of bonds (chemical or not) is that relies on a ‘topological’ partition of molecular density. As a consequence his concept of an atom in the molecule is, in general, not a transferable entity, contrary to traditional chemical thinking. 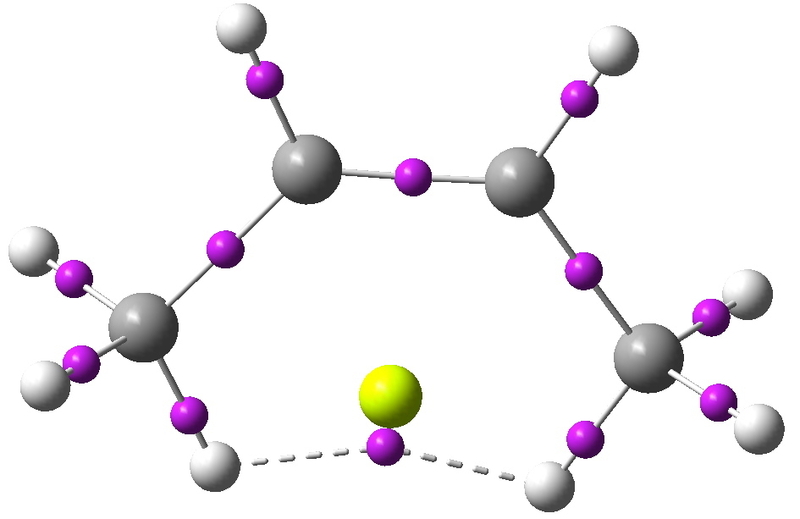 Are close H…H contacts bonds? is licensed by Henry Rzepa under a Creative Commons Attribution-Noncommercial-Share Alike 3.0 United States License.